The most important thing for me on Valentines Day is coming up with some sort of surprise. It doesn’t need to be expensive just cool and thoughtful. 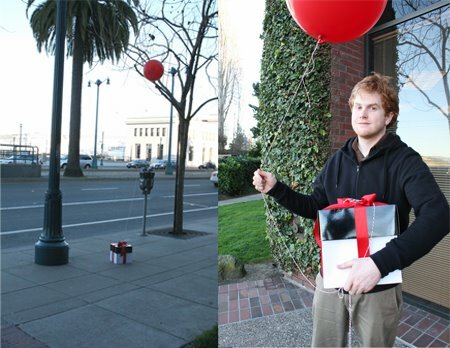 Last year I tied a large red balloon to a box and made the string so long that Paul could see it from his second story office. I called him and told him to look outside–and all his coworkers gathered around the window to watch while he went down to get the box. I filled the box with all of his favorite things. Love this! I’m all about surprises! Do you just keep a supply of those cool round balloons on hand? that is such a clever and thoughtful idea! that is a great idea. i like to cook, so i’m thinking about cooking something really fancy for my girlfriend. (boring, i know) i can’t give too much away though, we share a blog so i’m sure she’ll see my comments. anyway, i can’t wait to see what other ideas you are going to share. I love the balloon idea. I’m trying to think of something good for my husband, but we’re also saving for a new house, so I’m trying to do something frugal as well. Wish me luck! mu husband would KILL me! my husband might kill me too – but I think its a great idea. I might just do it anyway. Of course, Vday is on a Saturday this year – so he won’t be at work. Maybe I’ll save that idea for another year. how cool of a wife are you, J? Paul is one lucky guy. can’t wait to hear what you do this year! I agree with the other comments-this is a great idea! You’re so stinkin’ cool. That is lovely…and so romantic. I want to do something awesome for my husband as well this year. Thank you for your endless inspiration. I concur with Kim’s point: you are “stinking cool”! FANTASTIC IDEA I like to do mushy things like this for my boyfriend all the time. This year he’s away for Valentine’s Day and our Anniversary so I’m going to send him a little something by mail and completely flip out for his birthday! He only knows that I have a plan, but I always have a plan. I bet your husband adored the balloon. i remember this from last year, such a sweet idea. good wife. I could do this pretty easy since Coby works in the room next to me at home. i want to do this! such a great idea!! I love surprises!–I actually posted my plans on my blog today too. What a brilliant, brilliant idea! I LOVE coming up with surprises but I don’t think I’ve ever done anything that cool! I may just have to steal this idea…simply inspired! that is so romantic i can hardly stand it. Where did you get the box? I’ve been looking everywhere for one and I can’t find anything. A tip would be great! Now that’s romance. So beautiful and so perfectly done. I hope you don’t mind I mentioned it on a new blog I just started—giverslog.com. Thanks for a great blog. I’m a long-time follower. Wow! she is so sweet,what a perfect surprise so touching. Keep posting!